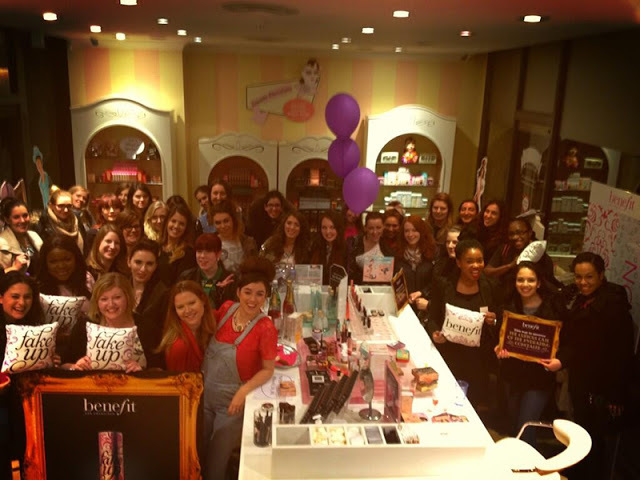 Last week saw the last of the Benefit Fake Up blogger tour and it ended in my home turf, London. Always leave the best till last eh? Kidding, kidding! So I headed into the big smoke to learn all out Benefit's latest offering, meet the ladies behind some of the Benefit work and generally have a great time. I can't even deny it- Benefit know how to party! But what is Fake Up? Well its the latest (and greatest) concealer on the market. Its hydrating, long lasting and it won't sink into those pesky smile crinkles (technical term) around our eyes. I definitely feel more confident popping this on after a night out and I've actually used it all over my face as a concealer- apparently this is what Benefits team at LFW did when running late on their models, including Cara Delevingne, no less! It works great as it provides a great level of coverage but feels light and moisturising on the skin. It comes in three shades, all of which we were kindly given to take home by the Benefit team, as even for paler ladies like myself, the two darker shades can come in handy. We were given a quick demo on how to use them as a way of contouring (by Benefit's own 'Head Makeup Artist, Trend Artist and Brow Expert' no less (yup, real title!)). Simply apply the darker shades in your contour areas, blend and then apply your foundation over the top as usual- a much lighter form of contouring than layering on the bronzer. As it is Benefit's 'Hello Flawless' one year anniversary, we were also given a 'Hello Flawless' compact to take home each, in our shades. I was matched to 'Honey' which is a slightly warmed up version of my actual skin tone. I love this handy compact on the go, as it can be used as a cover up (by using the sponge) or a powder (by brushing on with the powder brush). Perfect for on those tube touch ups! Above is a photo of the whole team and all the bloggers (borrowed from Bloomzy!) You can see me nestled in the back left, next to Anna from Vivianna Does Makeup. Thank you Benefit for having me!